Julee's Mojo Monday #55 sketch is sure a fun one! I love square cards, yet I rarely find myself making one. I guess it's because most of my envelopes aren't square (and the square ones take a little more postage to mail). But, Julee cleverly pointed out in her post that if you make your card 4.25" x 4.25", it will fit in an standard card (4.25" x 5.5") envelope. That is when the light bulb went off in my head! Cardstock: CTMH; Patterned paper: K & Company Berry Sweet; Stamps: Verve, PTI; Ink: CTMH, Memento Tuxedo Black; Cuttlebug embossing folder; Spellbinders ribbon tag; Star Dust stickles; Ribbon: reasonableribbon.com; Other: paper piercer. How funny a lightbulb went off with me too when she mentioned they will fit in a standard envelope. 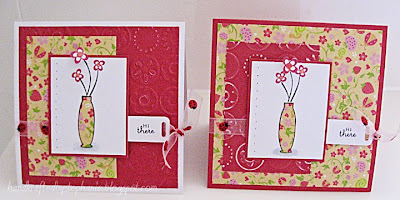 I too love square cards but hardly make them. You did a great job on the cards!